The Brew Works is again hosting their Brewer For a Day competition for next year’s Lehigh Valley Beer Week, but this year they’re adding a twist. Brewers entering the LVBW Brewer for a Day contest are invited to brew a 5 gallon batch of their best beer and enter it into the contest. Entry info can be found here and must be submitted by June 23rd. The twist on this year’s contest? The entries will be poured by the brewers at a festival being held August 23rd from 6:30pm to 10pm at the Allentown Brew Works that is open to the public. 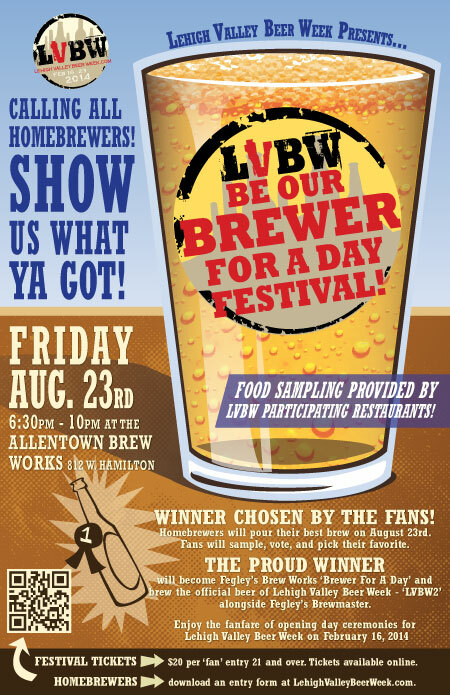 The fans then vote on their favorite beer and the winner will get to brew their beer as LVBW2, the official beer of the 2014 Lehigh Valley Beer Week. For fans interested in attending the festival, the tickets are $20 each and can be purchased here. This is going to be a great time! Hopefully someone from the Lehigh Valley Homebrew Club whips up the winning batch.